7. 🌊 The "wave effect"
The key goal of this feature was to allow the Talentoday users to share their personality, motivations and Talent ID on social media such as Facebook, Twitter and LinkedIn. I was responsible for designing the product (Web interface and images to share) and managing the project. 3 weeks to code the project for a delivery mid-March 2014. Designing an image to share on social media that people would be visually pleasing. Making sure that the image is easy to understand, and included Talentoday branding with the logo and URL. Designing the sharing user experience and user interface. Deciding which social media to use. Later we would discover that having a scalable feature was actually a big challenge as well. Talentoday was designed for BtoC and BtoB. Altough both would be able to share their personalities, this release was intented for the BtoC audience. An iPhone app was released during the same time, but wasn't part of the scope of this project, as it was handled by a web agency. During early 2014, the Talentoday team was composed of 12 people. This project involved most of the company. The project strategy was done during the Executive meetings between my CEO, COO and me. The Back-End development was done by my coworker Daniel. And I was working on the product and UX. A few weeks after the release, once the project started to go viral everyone in the team jumped to help: All the developers improved the performances of the websites and did some adjustments so the website can support more people. On the other side the marketing team communicated about the questionnaire and the personality feature which helped people know about Talentoday. Having everyone involved in this project was one of the best experiences of my life. It was motivating to see all the team working for the same goal with such devotion. I chose a square for the format of the image because it was the most adapted for mobile sharing. I did multiple tests by sharing mockups on Facebook, Twitter and LinkedIn to see what worked best. Only few days after the release of the sharing feature we started to see more and more people coming to our platform. Thanks to our Back-Office we realized that people were coming by batch from the same school everyday. For example I remember seeing one of my friend in the Back-Office along with 45 other students from the same school the same day. And I didn't even asked my friend to take the questionnaire. But I did share my personality radar on Facebook. 45 people from the same school back in time was giantic. We had less than 50 people signing up per day on average so events like this were definetely noticeable. We decided to investigate this trend and found out quickly that people loved to share their personality radar on Facebook and it was encouraging people to take the test. Of course this was the purpose of the feature so we weren't totally surprised but the speed of the propagration made us think about other factors. At the begining when peple were signing up from the same school so we were wondering if teachers asked their students to take the questionnaire because it was actually our main source of users in the past before the release of the sharing feature. End of March, only 3 weeks after the launch of the sharing feature we start seeing a pic of users in Peru 🇵🇪. While it was a total surprise that this country was the first one to go viral the website was available in Spanish thanks to the work of my colleagues Jocelyne and Sol. Also following the virality impact study of our product Jocelyne and Paige did an amazing job at communicating about the product to make sure that students would sign up. The amount of people we encounter every day was amazing and it doubled everyday. But it did come at a cost: Almost everyday the website was down because of the number of users. In order to solve this issue we paused all of our projects in progress and spent time to improve the scalability of the website. At this moment the Engineering team was spending about 12 hours a day and 7 days a week optimizing the website. People only cared about taking the personality assessment and sharing their results on social media. The feature to invite users via email was skip most of the time. The careers feature wasn't used much. People did't compare a lot with their friends. On the other hand we looked at which back-end requests were taking most of our resources. And while features like "Compare with your friend" didn't take much resources the "Careers" and "Invite your friends via emails" sucked a lot of power from the Heroku dynos. We decided then to hide (via a simple display: none; in CSS) the features "Careers" and "Invite your friends via emails". After push in production it appeared that we were right and the website was much faster while having a similar number of users. The more users we have the more we try to optimize our back-end requests and increase the number of dynos on Heroku. But soon we reached the limit of 100 dynos on Heroku and decided to switch to AWS. Money was also a factor: From less than $500 per month for our servers at the begining of the year we were now paying $20,000 a month. Begining of May we successfully transition from Heroku to AWS. 🌊 7. The "wave effect"
We analyzed a lot the flow and behavior of our users. We were mainly using our internal anaytics, Google Analytics and Excel. This analyze became handy and allowed us to predict a sad truth: Most of the virality was only temporary. We had a website that was great for a one time usage every 6 months but not for a weekly activity. Indeed once the user completed his/her questionnaire he/she hasn't a lot of other stuffs. And users were only able to retake their personality assessment every 6 months. The virality was easy to follow when looking at the number of users per country. What was happening is that people took the test and shared their results on social media. But once a percentage of the population had taken the test they didn't have any reason left to come to the platforn again until 6 months. 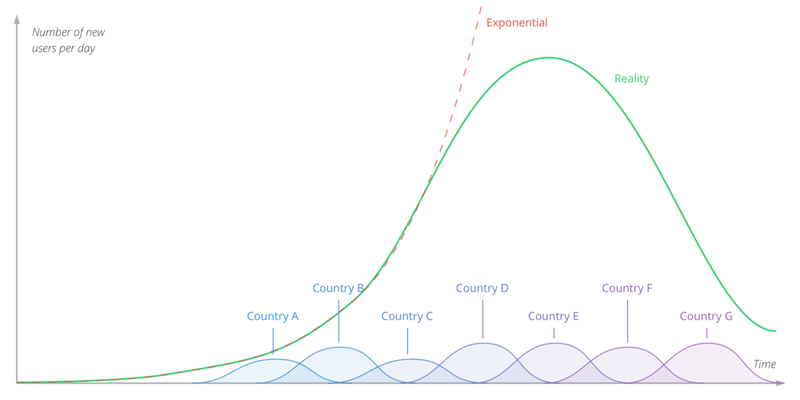 But because people from more and more countries were signing up everyday the sign up per day chart was looking like an exponential. Luckly we were able to foresee the reality which was that the number of sign up would drop. It allowed us to prepare the future and not to focus only on the sign up figures. It is important to notice that even if the number of sign up drastically dropped we were able to keep more than 2,000 new users per day, compared to less than 50 users a day at the begining of the year. So the feature was a total success. The outcome of this project was simply amazing. From about 14,000 users before the project start we were able to quickly reach one million users and later reached more than 3 millions. Brand awareness: With 3 millions users we were able easily market the Talentoday brand. Attract new investors and encourage the current ones to invest more in the company. Great for data scientists. With such an amount of data we were able to attract data scientists and build algorithm without compromise the privacy of our users. We built some in-house analytics to know more about the usages of the sharing feature. 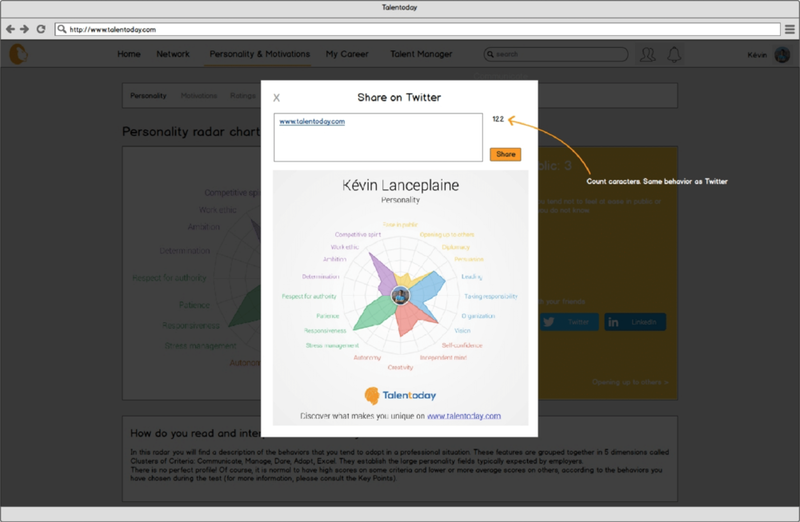 By far the Personality radar was the most shared (>90%) while the Talent ID and Motivations were about the same. Out of the 3 sharing options (Share on Facebook, Twitter or LinkedIn) Facebook was the most popular by far. Shares on LinkedIn were almost inexistantes. The lack of sharing on LinkedIn could easily be explained. Back in time the LinkedIn newsfeed was almost not used. Also the LinkedIn UX of the newsfeed wasn't great to say the least. We were often joking asking test users to find a content that they shared. And no one was able to find it ^^. Since then the UX and usages of LinkedIn improved a lot. Early 2014 we started a project with a Stanford PhD student. We were worry that the length of the questionnaire - 128 questions and 15 minutes - could be reluctant for some users. The data-scientist job was to identify using which questions could be removed while keeping the precision of the results. But after the success of the questionnaire we decided to cancel the project. The millions of people proved us that a long questionnaire isn't incompatible with a high virality. Also after interviewing people we realized that altought a long questionnaire was sometimes annoying it was giving people a feeling of reliability. One of the leasson of this project was about the scalability. We realized how important it was to design a scalable product from the begining. The way the algorithm of the "Career recommendations" feature were working for example were not scalable at all. For future releases we made sure to take into account the scalability. Escpecially because we were no longer a website with 14,000 users on it. We realized along this project the importance of paid customers versus free customers. Yes having a lot of users on the platform was great but it was also costing a lot of resources and money. In the meantime the few Enterprises customers were generating money. In the future we decided to move more and more on the BtoB side. We decided to keep BtoC features because we wanted to help students and users discover themselves for free but we limited the features and the resources we allocated for theses projects.